I lost my father and mother to cancer in 2008 within three weeks of each other. We lost Sues father, my uncle and friends, all of which went down the medical route. During my parent’s and family's illnesses I witnessed things that I was very uncomfortable with in the conventional ‘standard of care’ cancer treatments. In short they followed the allopathic system of cut , poison and burn and died. These experiences set me on a journey to find out what was going on within the medical system that could allow such things to happen. We are now at one person in two who will get cancer according to Cancer Research UK and no one seems to be addressing the elephant in the living room in terms of the reasons why this is happening. I spent the next two and a half years researching cancer and Sue thought that I had lost the plot. I found peer reviewed studies which stated that up to 90 to 95% of cancers were caused through diet, lifestyle and environmental factors and only 5 to 10% genetic. This meant that cancer was massively affected by epigenetic factors which were largely in our control. These epigenetic factors also bore relevance as to whether the body would actually express any DNA predisposition or not. I read that the amount of people who die of cancer is like ten jumbo jet planes crashing every day, 365 days of the year and yet we are told that we are winning the war on cancer? It seemed illogical to me that a person with cancer should be conventionally treated with toxic treatments, destroying the immune system without even considering addressing causational factors. Was this not a little like trying to dry yourself off whilst still in the shower? In late 2010 Sue experienced severe stabbing pains in her abdomen whenever she ate, in fact even when she first placed the food into her mouth. Sue became lethargic with no energy and lost a stone and a half in weight quite rapidly which was very concerning as she did not have much weight to lose. It was found that she had a 60mm x 50mm x 54mm tumour on the liver which was strangulating the bile duct tubes coming out “like Charing Cross Station” to quote the Doctors words and he explained that he had not seen a cancer of this type in a woman of Sue’s age. We were told the tumour was inoperable and untreatable with it being in such a highly sensitive area. It was also stated that there was little hope as the tumour was strangulating the bile duct tubes which would prevent the liver from functioning and would be unable to process toxins. In effect Sue would be poisoned to death. An oncologist explained privately to me that cancers in this area are usually more of the aggressive type and that chances of survival were unlikely and he warned to expect swift deterioration. Sue also had several suspect nodules found on the tail end of the pancreas. 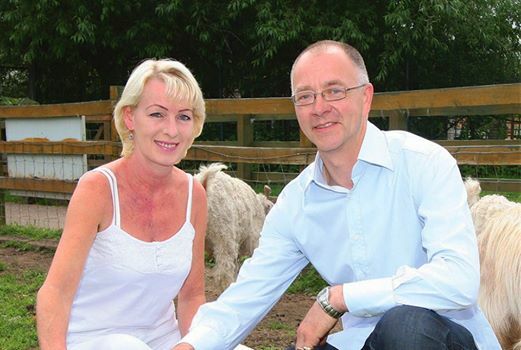 Sue was terrified as she was shown the scan of the large tumour along with the several small masses on the pancreas. Sue was prescribed Tamazopam sleeping tablets because she was told that she was going to need them and the parting words were that of, “I am so very sorry”. Devastated, Sue went out and purchased £25.00 worth of goodbye cards for her family and friends. I remember when Sue first broke the news to me that I felt numb, like it was not real. However, after consoling Sue I went out immediately and bought some Goji berries, blueberries, bitter apricot kernels and organic green vegetables for juicing in an endeavour to take control. Sue and I sat down and discussed at length about what I had been researching over the last couple of years and Sue agreed to throw everything into what I had learned as there was nowhere else to turn. Our protocols were numerous, but we started with cleansing the body, with the colon cleanse, liver cleanse and parasite cleanse. We could not afford to see a specialist naturopath, but we did consult an independent nutritionist. We had a weekly Organic veg box, came off of all processed foods and drinks, no milk and dairy, no processed sugars no simple carbs and we limited certain fruits. We juiced with green leafy and cruciferous vegetables, plus celery and cucumber, broccoli etc. We included apples, pears, lemons and limes with ginger, carrots and beetroot to make the juices more palatable which were relatively low glycaemic and complex carbohydrates. Basically colour of the rainbow vegetables and raw salads and herbs in abundance. We took out red meat and pork and reduced meat consumption to small palm of the hand sized portions of organic chicken and fish. Good fats were also important like extra virgin organic coconut oil, extra virgin olive oil, flaxseed oil, avocados, nuts and seeds. When giving up sugar and restricting carbohydrates this helped Sue to gain energy from these natural fats. We used apricot kernels which we considered a big part of our armoury and Sue took between 30 and 35 per day. These were taken maybe five or six at a time throughout the day, not all at once. Sue felt a great deal of confidence and positivity in them and she considered them to be her medicine. We used vitamin C, vitamin D3 with K2, niacin (B3), Turmeric (curcumin), black pepper, probiotics, fermented foods and also broad spectrum digestive enzymes. We also used Milk thistle to support the liver. Table salt was thrown out and Himalayan pink salt and Celtic sea salt took its place, used in moderation. We got rid of the microwave, used a water filter to remove toxins and made daily herbal teas including green tea, ginger tea, turmeric and peppermint tea. We sourced herbs from our garden like nettle, rosemary, parsley, thyme and lemon verbena. We believe strongly in the power of prayer asking everyone to pray for Sue in Jesus name and I put all healing down to God, giving Him the glory. I too followed many of the protocols and dietary changes and found that my arthritis in my hands got better as did Sue’s candida, eczema and fungal toe nails she had for twenty years. Resolutions: We were apprehensive, but we were expecting to see some decrease in follow up MRI scans. We were however overwhelmed when the oncologist told us that the large tumour on the liver which was strangulating the bile tubes was now just scar tissue. However Sue still had the smaller masses on the pancreas which were a concern. Sue still had pains in her stomach which were becoming less intense. We refused to have biopsies of the pancreas which the oncologist was very unhappy about. This was due to the risk of metastasis which he refuted at first, however he eventually agreed that there was a 2% risk of metastasis which he thought to be acceptable. This 2% statistic made no sense to me because if you puncture the tumour then it will naturally bleed out through the line of the needle or core biopsy, directly into adjacent areas, bloodstream or lymph. Even if this low stated statistic were true which I do not believe, then this would mean that around 6500 people per year would have their cancer metastasise through biopsies. It is worth knowing that metastasis can often be a much more serious situation than primary tumours. The final oncologist was pleased for us and a little more pleasant than the former and he said that if we were adamant with our decision which was our choice, then to come back if we needed to. We continued on with the strict protocols which became part of our lifestyle and the pains gradually started to subside after several months. I can say that we have never eaten so well with good old home cooking from fresh, with soups, stews, curries and stir-fries using an abundance of herbs and spices. We trust that the strict lifestyle, dietary and detoxification changes we chose to undertake, along with prayer have proven there efficacy. Sue gained back weight over the year and is now healthy and has a passion to share the principles of what we chose to do and why we chose to do it. We put on FREE monthly seminars where we share health enhancing information http://www.cancer-acts.com/events. We are seeing a number of people from our seminars who are following similar principles who are doing well, some of whom tell us that they do not have cancer anymore. Of course we make no claims, promises or guarantees as life comes with no guarantee, (as is also said on the cansurivivng site) but surely this has to be logical to build the immune system and to create a healthy bodily environment in which cancer struggles to thrive. To change a lifestyle that was not working to one which health can flourish and thrive. We do not sell supplements or products and we put on our seminars free of charge. We also speak with people either by phone, skype or in person as this has become our passion. The only thing we have for sale is a little book I wrote which details everything that we chose to do. 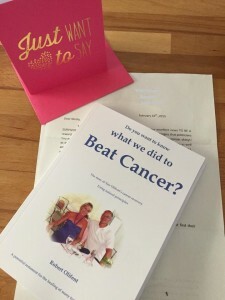 Our book is called ‘Do You Want to Know What We Did to Beat Cancer’ which can be obtained from our website http://www.cancer-acts.com . There are many health protocols and every person and their circumstances may require an individual approach. We suggest that people gain as much knowledge as they are able in order to make informed decisions. Seeking guidance from a qualified health professional, naturopath or nutritionist may also be good advice. gain knowledge and use wisdom to implement that knowledge in formulating an action plan which is right for you on your journey back to health. If other people are doing this then why not you too?